I still haven’t found a job, but if you take into account the number of people I met in the town this week, surely it’s just a matter of time before a) I know everyone or b) people pass the word and a job comes my way. Restaurant owners, Enotecas, and this next week I will hit some of the hotels. And I’m not counting out the Twilight movie which films here this week. Surely there must be need of an enterprising English speaker to help with something! In my travels this week, I also stopped in at the language school Il Sasso. It’s a pretty famous school for foreigners wishing to learn Italian. I decided it might be good for me to ramp up my speech since my short supply of conversational chitchat has pretty much run it’s course with the people I’m getting to know better. The receptionist was a German woman, Heike, who has been here 12 years and who tried to assure me the first three months are the worst. “After that, you won’t be fluent, but your comprehension will have improved enormously.” That’s good news because my intelligent look coupled with a nod when I haven’t quite grasped what the person has said has backfired a few times in the last few days. I think I actually insulted two people with this method. Thankfully, when I finally figured out what they were saying, I was able to “Mi dispiace, Non Ho Capito bene” (I’m sorry, I didn’t understand well) my way out of the situation and give my stock apology for my horrible Italian. (I’m reserving the self-deprecating, “Sono Stupida” for worst-case scenarios and I’ve no doubt there will be some.) With all my flubs and blunders, I’m actually not afraid to speak and I’ll just start over again if I’m not making myself understood. (The man at the hardware store endured five minutes of me trying to explain over and over again with corresponding mimes that I wanted electrical tape to repair my laundry wire). After Heike, I met with Sylvia who gave me a take-home test to complete and spoke with me for two minutes. Of course, I sounded awful as I was trying not to make any mistakes when speaking to her, so I’m sure she’s going to mark my file with “needs remedial assistance” or some such before I meet with my new tutor on Monday. She did invite me to a meet and greet that is tonight with other students who are beginning their courses at the school. I may stop in although I heard enough whining in English in the twenty minutes I was at the school, to get my fill. One poor college-aged kid was begging the receptionist to talk to his hotel because he couldn’t make himself understood. This was apparently after a two week course in Italian. As it turned out, his credit card was rejected so his whining quickly turned to panic. The efficient Heike took charge and helped him. I made my exit, hoping my lessons will yield a little better result. My other accomplishments were more domestic in nature. I baked my first batch of brownies and made my first ragu. The brownies were a bit of a challenge since there are no baking ingredients to be found at the grocery store. I ended up using Lindt dark chocolate bars and some snack packs of walnuts, deciding to categorize this batch as an experiment. I wanted to make the brownies as a “thank you” for Marinella, and for Massimo, Angela, and Gabriella and the woman at the cheese store (I keep forgetting her name which is crazy since I go in there all the time!). The brownies came out fine and I stopped in first at Gabriella’s at the Legatoria. This is the store where they sell beautiful journals, etc. She is the bookbinder and has gone out of her way to give me suggestions on places to try my luck for jobs. As we were chatting, the cheese lady came in and I handed her the brownies. She thanked me and left. Ten minutes later, while I was still chatting with Gabriella she came back and told me how much she liked them and even asked for the recipe. I was relieved that my dolce Americana were a hit. I repeated my deliveries with Massimo and Angelo at the bar and they broke out some prosecco and we had a toast while they sampled the brownies. It seemed like a lot fanfare for brownies, but again they were well-received and I was relieved. Angela is a good cook and she grilled me on what was in them and thankfully my Italian “ingredients” skills are a little better than the rest of my vocabulary. Of course the primary thank you was for Marinella and she took the brownies and even invited me into her house for the first time. Then days went by and she didn’t mention them. I pictured her and the single sons sitting over there ridiculing my brownies and my pathetic attempt to cook. I can’t help it, this is where my mind goes! But yesterday as Cinder and I returned from a long walk to the flower shop we saw Marinella and she came over with the plate, telling me they were “Buonissimo” and that everyone in her family loved them. Of course I’ll never know if she really liked them, but she seemed sincere. And the important thing is that I made them. Much like the ragu, which was just ragu, but was important because I finally got the nerve to go to the Butcher’s shop on my own. It’s quite intimidating seeing all those lumps of meat and not knowing what to call what you want. But once I did it the first time, I felt better. The ragu was okay, but needs work! Our week ended with an energetic clean of the apartment. Floors were scrubbed, rugs beaten (I’m not kidding), and wood polished. I even bought a plant to make it feel complete. The owner of the flower store, Barbara, is one of the people who has expressed interest in practicing English, so I thought it would be beneficial to buy some flowers! Cinder adored her because, after our hike over there, she brought Cinder a big pan of water. It’s the simple things that make us happy. 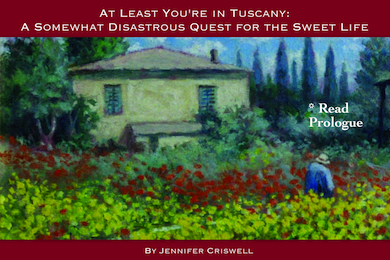 Chasing flies, baking brownies and cleaning the house–just a normal week in Tuscany. ← The good, the bad, and the…Dio Mio!